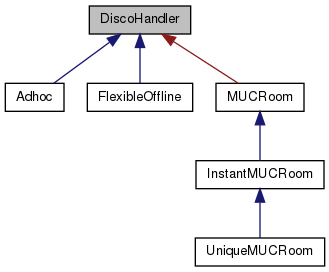 A virtual interface that enables objects to receive Service Discovery (XEP-0030) events. A class implementing this interface can receive the results of sent disco queries. Definition at line 31 of file discohandler.h. Definition at line 37 of file discohandler.h. Implemented in Adhoc, and FlexibleOffline. Reimplement this function if you want to be notified about the result of an disco::items query. Reimplement this function to receive notifications about incoming IQ stanzas of type 'set' in the disco namespace. Returns true if the stanza was handled and answered, false otherwise. Definition at line 72 of file discohandler.h.